My fantasy tree fort is a log cabin high up in the Ashley National Forest along the border between northeastern Utah and Wyoming. I definitely have an indoor toilet, a comfortable one. There is a big honkin’ stereo and no neighbors to complain about the noise (although oftentimes I just go with the sounds of quiet nature). Yes, I sport 500 TV channels and have an endless supply of books to read in my comfortable bed, chairs, and sofa. I spend much time just relaxing in a rocking chair and I have learned to play the guitar pretty well. I have an exceptionally fast internet connection that allows me to listen to radio from wherever I want whenever I want. I correspond a lot with a few select pen pals. Actually, it is not so much correspondence as it is taking turns “holding forth.” I write a bunch, eventually completing and selling a couple of well-received, thoughtful novels that folks like to read more than once in order to take it all in. My sweet wife is there with me but mainly only in the evenings and at night. She arrives home and we often drift into the bedroom and just lay there and talk for hours. She hugs me mucho. Sometimes a hug can last an hour; no words just an intense pure beautiful hug of love. I exercise and eat right. I am healthy and I look it. I’ve grown a beard and I have long ago cast off my appearance complex (mainly a result of looking pretty good). During the daytime, I am usually alone. Somehow, the need to buy things – besides healthy food (no more Diet Coke! ), books, and CDs – just doesn’t come up. The cabin is very comfortable and the stereo and TV are first rate, but decorative trinkets are few and those that are displayed have some special significance. I walk and hike through the pine forest often. 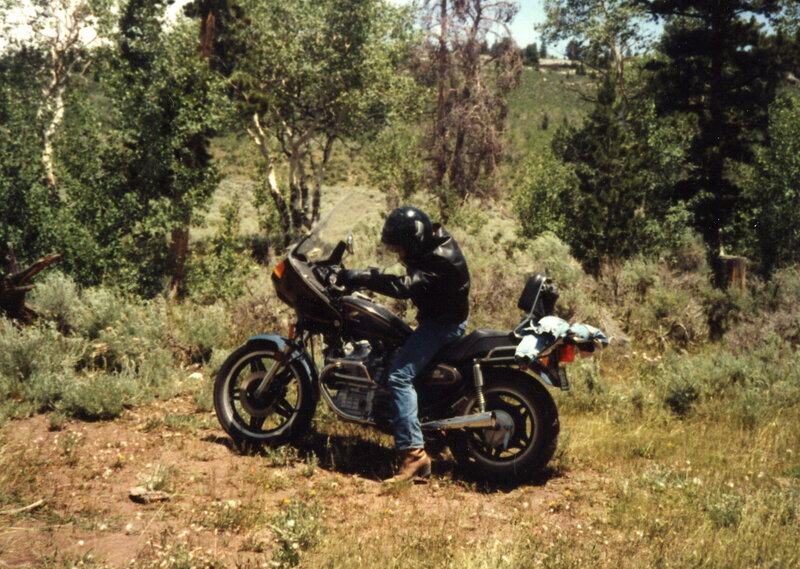 As I think about it, I must own a nice motorcycle too and ride it around the old logging roads. Visitors come by at my invitation for poker, dominoes, sports on the tube, and conversation. They stay long if I’m into it and don’t rush home if the palaver is good; instead, they sense exactly the right moment when I start to tire and crave privacy. As such, every visit is perfect, no one leaves either too early or too late. By this time my kids are grown and on with their young, healthy, happy lives. I see them often, talk to them even more. They make me very proud and continue to love me openly. They both are still willing to sit next to me on the couch with my arm draped over their shoulders; no “I’m too old for that” from either one, not even the boy. They consult me on big decisions and confide everything to me. Truth be told however, their lives are going really well so they don’t really have many worrisome things to confide. As I hit the age of 71, but still looking like 55, the “system” gets wise to my autonomous ways and, after a 37-day stand-off, an FBI sniper gut shoots me when I accidentally doze off in my chair near the window while inexplicably listening to Nelly Furtado. Just like that and in the blink of an eye, I die. There is no heaven, no ball of energy. I’m just gone and my physical remains soon rot away to nothing. I do, however, leave behind volumes and volumes of prose, correspondence, poems, essays. My descendants dig it forever; they are proud to be my descendants. Thanks for the chance to revisit this one. I can confirm that I still pine deeply for that cabin… Re this being the second: Some of these early posts, to include this one, evolved out of prior email correspondence with friends/family, so what you’re seeing reflects a relatively massaged offering vice something as off-the-cuff as my initial pace might have suggested. As always, your kind words are much appreciated. My pleasure. It’s a trove to dive into when I’m a bit fed up with record reviews!